Is The Bull Run In Bitcoin Finally Over? With a tremendous surge from $900 to $11,000 in less than a year, will the bull run in Bitcoin continue or is the end very near? When a stock or a financial instrument goes up by 1000% in a single year, it will never fail to make the headlines. Financial websites are now covering cryptocurrencies such as Bitcoin and Ethereum. Brokers are also touting the benefits of trading Bitcoin from the comfort of your smart phone. Even the CME is offering a futures on Bitcoin very soon. Is the bull run in Bitcoin going to be over or is this just the start of a massive bull run like Microsoft's stock has done over the decades? If a new currency is able to do so many things that paper money could not do, it will soon surge in popularity. Despite China's government having a crackdown on Bitcoin, other governments such as Japan has embraced and welcomed them. For those of you who know a little about economics, we know that supply and demand will cause the prices of financial instruments and commodities to fluctuate. If there is great demand, then the price will go up. It will continue to go up and up and up until supply and demand reaches an equilibrium. When demand no longer justifies the price, eventually the financial instrument will go down in price. By the way I did a case study on Bitcoin titled How Bitcoin Crashed 40% In 2 Weeks And Bounced Back Up To Previous Highs. That was when Bitcoin was around $5000, today its at $10,000! One of the things that I like to do is to separate the news, personal opinions and price action. You see, we are in a world that is bombarded with information overload. And when something like Bitcoin goes up 1000% there will spring up lots of personal opinions on what will happen to Bitcoin. Some may say its a bubble, some may say it will go higher and some are just purely skeptical. I always like to look at "price" because price analysis do not lie and they often tell us the state of the health of a stock or any financial instrument. So, let's take a look at the daily chart of Bitcoin below. Yesterday (from the day of this writing), Bitcoin went up to $11,000 and then went down again to $9000. Wow, that is an amazing volatile trading day for Bitcoin or any financial instrument. Traders and technical analysts may see the price action as a topping tail or a super topping tail candlestick pattern. Well, it can be scary to see something trade so wild in a single day. But let's dissect the chart of Bitcoin and see what it is trying to tell us. I often like to quote the famous Wall Street maxim of "The Trend Is Your Friend". What this means is, if a financial instrument is in an uptrend, the likelihood of it continuing to go higher is very good. We need to stay with the trend until it changes. 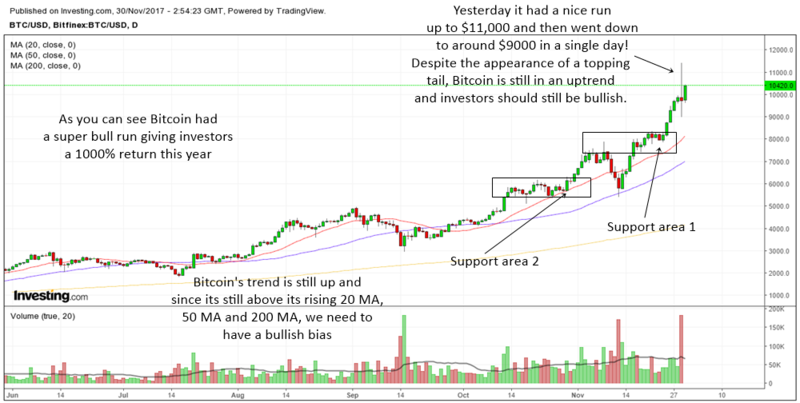 When Bitcoin was around $6000, I suppose many people were afraid that it will crash, however the charts were telling us that it is still in an uptrend and therefore it pays to remain bullish bias. The definition of an uptrend is the stock or financial instrument making higher highs and higher lows. So far, the price action of Bitcoin is still making higher highs and higher lows. Sure there is a topping tail that appeared but there is ample support below to keep it from having a big crash. Another thing is Bitcoin had not yet made a lower high which is the classic prerequisite of a change of trend from bullish trend to bearish trend. All trend changes and crashes happen by the financial instrument making a lower high and then a lower low. So far we do not see it happening to Bitcoin yet. When and if it happens then only we need to be careful of a trend change. Moving averages are very good to be used as trend following tools. So far, Bitcoin is still staying above the rising 20 MA, 50 MA and 200 MA. This is a picture of trend strength and therefore, investors and traders should still remain bullish on Bitcoin. If and when Bitcoin starts to drop below the 20 MA and 50 MA, we need to be careful of a trend change. Support areas on the chart are important to halt any drops or correction. Price congestion are support areas. The first support area is around $7000 to $8000 which should halt any corrections to that area. Traders can look for a bounce up if Bitcoin drops to there. The second congestion support area is around $5500. In a normal chart, these areas of support are good but since Bitcoin is so volatile, a drop to even $8000 represents a 20% drop. Well, that is what you get from a hot stock or instrument. Fast gains can often have volatile corrections. In summary, Bitcoin has really been probably the investment of the year. Despite volatile corrections and drops, the trend is still up. Since the trend is up, it pays to remain bullish bias until the trend changes.